Woke up early for the Hellride, but was still in the grips of DOMS, decided to skip it, get a little more sleep and roll around with the Spoke(n) crew instead. No point digging the hole any deeper. The ride cruised down to Mordi, I sat in and almost lost my mind trying to resist initiating a sprint. The pace was easy and the legs were feeling ok, I began to wonder if I'd made the right choice in skipping the longer harder session. At Mordi we just had time to turn ourselves when the Hellride come past, so we jumped on for the free tow. The bunch was massive, so I (and everyone else) worked up the bunch to get to a safer location. The push up the rollers made me realise I'd made the right choice. 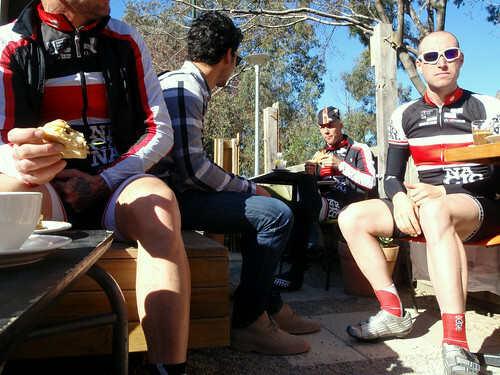 With spanked legs, it was a perfect morning for coffee and stories with mates. Carl has offered to motorpace me next week. I'll have to talk to Jeff about training, possibly go on wednesday to ensure I'm in good enough condition. I don't think this is an opportunity I can afford to miss.